Grab the controls of your sleek and deadly high-performance racing machine and head into an action packed race of the future, where survival is the only law. Roar down the straightaways and spin around turns while dodging land mines and toxic spills. Blast enemies out of your way with your high-calibre machine guns and other special weapons dropped by your support jet. Your object is to reach the Rally Point at the end of each level - 5O in all. The further you get, the more difficult it becomes. Avoid crashing into enemy cars. Watch out for crossfire from gun turrets. And if that's not enough for you, some levels are mined! To help you reach the Rally Point, you get refueled at the Check point (the halfway point of each level). You can also get extra fuel by picking up green globes you find along the way or by blasting certain enemies to force them to give up their fuel (shown as a red globe). Keep a close eye on your fuel level! If you run out, it'll cost you one of five lives. --From the Genesis Road Blasters instruction manual. �����Big Brother has taken away our guns! He�s taken our knives! Gosh, last week eight skinny CIA Agents and their fat leader kicked down my front door screaming �Where�s Elian Gonzalez?� �In A Cuban prison cell, I guess� was all I could say. �����Well one thing Big Brother can�t take away from us is our cars. I got me one sweet ride out in the garage. I don�t even let that baby get rained on. She�s a 7000 pound 1958 Cadillac Coup de Ville. Yeah, she might have a little rust on her and a busted windshield, but except for the missing rear seat and the crumpled right front fender, she is a cream puff. The wife calls her a �gas hog�, the kids �an embarrassment� but I call her �The Equalizer�. Let that pimply-faced school crossing guard try to stop me and all you�ll see are a lot of screaming, scattering first graders and coloring books littering the highway. �����So if you are annoyed by some slow driving granny or some preacher with a school bus load of kids or some loud-siren ambulance heading to a hospital then do what you should have the right to do: blow them off the road. Better here on the computer screen than on the real road. Or so my wife says. �����Run and Gun! Use your weapons to destroy everything that moves, except for the green balls on the road, which are extra fuel. Run over them and continue on your merry killing-spree way. 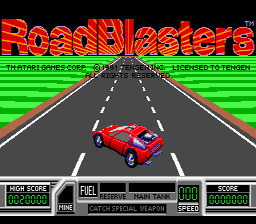 You have 50 levels of car-crashing, missile-launching, machine gun firing insanity ahead of you. Have a blast! �����You get to play with high tech weapons like Cruise Missiles, an Electro Shield that protects your car, Nitro Injector for increased speed and an U.Z. Cannon. And sometimes there is a jet that brings these goodies to you just like Santa. Free and everything. Yeah, at first I thought it was an alien space ship come to probe me, but it wasn�t. Just drive under the plane and the goodies come to you. If you�ve been a good little boy.